During the first bars of Open, ultracool bass player Simon Gallup seems to miss a break. The rhythm section sounds a bit confused. But only for a moment. Robert remains stoical and restores the balance when he begins to sing. Fortunately, Robert also appears in a good mood, hopefully recovered from the cold he had been suffering from for the past weeks. He is clearly making every effort to sing as good as possible. The psychedelic soundscapes of Open are being accompanied by numerous vivid spotlights, circling around in the huge venue and Vertigo-like projections on the five vertical screens behind the stage. Open is followed by the beautiful Wish-single High, a trilogy of Head On The Door favourites and a wonderful performance of Pictures of You. Then, Robert has an announcement to make. The next song is a song from… the Faith album… that we don’t play that much… It’s called ‘Other Voices’. The first big surprise of the evening. Other Voices has rarely been played for decades. 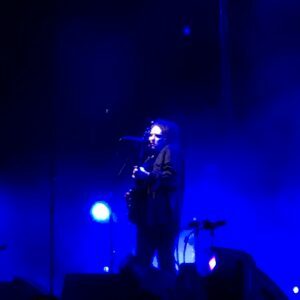 The last time The Cure performed this song in Holland was at the Rotterdam Ahoy’ Sportpaleis in 1987. From that moment on, it becomes clear that this is going to be a special night. Also from 1981 is the beautiful single Charlotte Sometimes, quite exceptional on this tour, followed by the starry-eyed Lovesong and euphoric Just Like Heaven. Then comes another suprise, the melancholic The Last Day Of Summer from the Bloodflowers album (2000). A song never played before in the Netherlands. Especially Roger has some beautiful piano parts here. 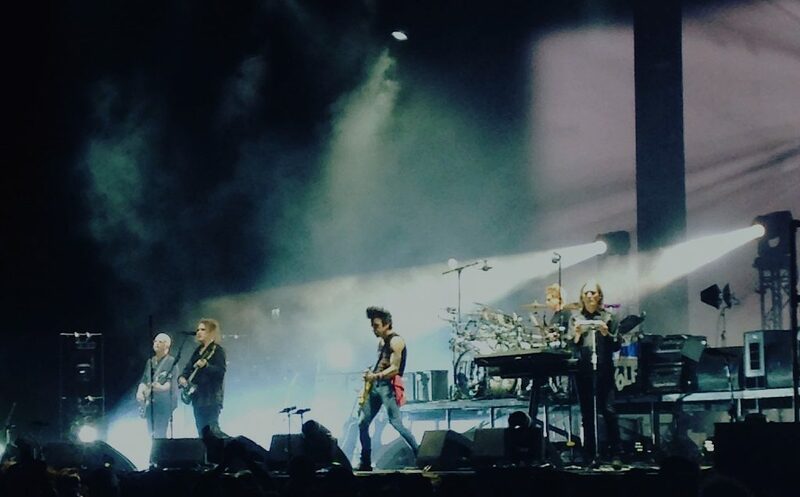 With another four heavy, long songs The Cure is slowly moving towards an epic ending of the main set. During 39 (also off Bloodflowers), another exceptional song on this tour, excellent drummer Jason and ex-Bowie guitar wizard Reeves cut loose. One Hundred Years comes across even more intense than on record due to the black and white projections of 20th century war, destruction and other miserable imagery. In the meantime, temperature has risen in the crowded Ziggo standing arena at the same pace as the beer consumption. Apparently this in combination with the loud, dense and dragging songs becomes a bit too much for some. A couple of times the first aid is being called to help exhausted fans out of the pit. And Robert launches into Three Imaginary Boys, the next surprise. But that song just proves to be a warm-up for the rest of the encore. A miniset of four Seventeen Seconds (1980) classics, the album that was so successful in the Netherlands. Especially the rendition of At Night is stunning, with beautiful keyboard strings by Roger, deep blue lights and of course dry ice all over the place. A Forest culminates in a bass solo from Simon, watched by Robert and Reeves from the side of the stage. This moment has become one of those little traditions on this tour. 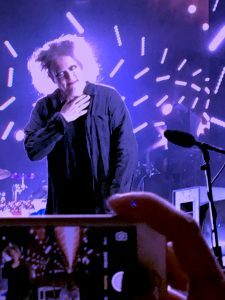 Another one is Robert and Simon leaning against each other during the hypnotising Burn (a song from the 1994 soundtrack to the film ‘The Crow’, played for the first time in Europe on this tour), which closes the ‘heavy’ second encore. For one more time the band returns on stage for a final encore of classic pop singles. Roger is joking around with the audience, making gestures that they should cheer louder. Robert sees this and does something similar, mumbling I should do that, but immediately shakes his head to show this is so unlike The Cure. Finally all of the audience is on its feet and even on the highest galleries people are dancing. 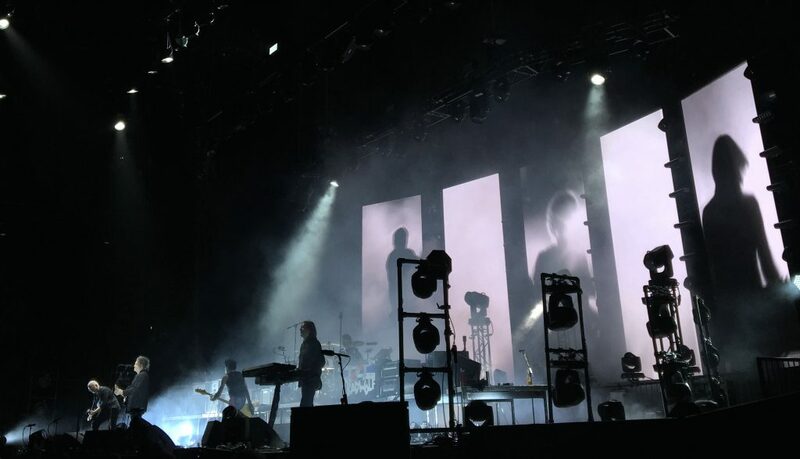 Encore 3: Lullaby, The Walk, Friday I’m In Love, Boys Don’t Cry, Close To Me, Why Can’t I Be You?